A 1937 Oregon State University alumna, Lois Bates Acheson was a long-time supporter of the College of Veterinary Medicine. Her gift of $21 million created a substantial endowment for veterinary medicine and funded its first endowed position, the deanship. In honor of her gift, the college has renamed the teaching hospital in memory of Lois Bates Acheson. During her lifetime, Lois Bates Acheson built a scholarship endowment for veterinary students, and in her will, she bequeathed an estimated value of $21 million to ensure quality veterinary education and research for generations to come. Lois Acheson passed away in 2004, leaving a legacy of business and philanthropic accomplishments. 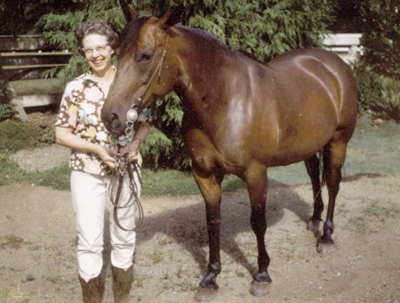 Her tremendous gift to OSU's College of Veterinary Medicine will benefit thousands of animals and people through the improved research, diagnostic abilities, and educational opportunities she made possible. 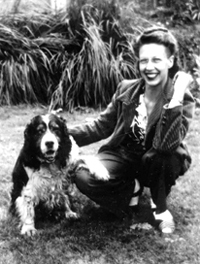 Acheson's gift reflects her compassion for animals and her life achievements. She was an avid horseback rider, owned numerous dogs and always had a treat at the ready for any dog that crossed her path. Acheson credited her OSU education with her success in business, so when she wanted to support veterinary care, she looked to her alma mater. Born in Barton, Oregon, in 1915, Lois Bates graduated from Estacada High School. While majoring in business at Oregon State University, she took every communications class available and held the second-highest editor position at the Barometer. After graduating, she was hired as an office manager at the Shipping News in Seattle. She built such a strong reputation that the owner of Black Ball Freight Service, Robert J. Acheson, recruited her when a similar position opened at his company in 1941 where Lois later rose to the rank of vice president. Robert Acheson and Lois Bates married in 1951, and Lois remained a key player at the company. She helped grow the business from 40 to 350 trucks carrying freight in Washington and British Columbia, Canada. The company expanded with the construction of the M.V. Coho ferry, running between Port Angeles, Washington and Victoria, British Columbia. When her husband passed away in 1963, Lois took over the reins of Black Ball and became the only female head of a major carrier company in the country. In 1975, she sold the trucking business to focus on the ferry system that still runs today.